Back of card: Derived from the King of Chalices (Cups). Printed in sepia on white, inverted on the bottom half of the card, so these cards may be inverted. Comments: You'd expect Italians to be typically colorful, and they are. Chalices are filled with knights & castles, mostly in shades of blue. They represet the Fianna people, the last of the Celtics. Pentacles, of green, show wee-folk - fairies, elves, gnomes, etc. They represent Tuatha De Danann, the ancient gods. Wands, in browns & grays, are savage warriors, armed with clubs. They represent the Fomori people, who were destroyed at the beginning of time. Swords - the red suit - are warriors with battle swords. They represent the Ulaid people, a race of intelligent warriors. With pink hair, they remind me of Vikings. Card 5, Dian Cecht, aka the Hierophant. The card shows a man in white robes with a sword in his right hand, standing in water. In front of him, 3 naked children play. The sense of the Hierophant is clear. He is presumably about to baptize the three children. What does the notes say? "Dian Cecht with his sons at the Fountain of Slaine. When he discovered that his children prepared better medicine than his and that they had surpassed his teachings, Dian Cecht became furious. He slayed the eldest and confused his other's secrets so that he alone knew the secrets of medicine." You would never guess that from the card. Card 12, Conia, aka the Hanged Man. "Cu Chulainn brought Conia's corpse to the Ulaid warriors. One day they espied a boy arriving in a bronze boat. He refused to tell them his name and never conceded peace to anyone. So Cu Chuliann challenged him but the boy was even stronger than him. Cu Chalainn was so furious that he pierced him with his javelin and only recgonized his son Conia on seeing the golden ring he had given him, but it was too late." The card shows a warrior holding the corpse of another warrior, who is clearly younger. Only one hand of the corpse is visible, there is no ring. The corpse is pierced in the right breast but there is no javelin in sight. What a corpse has to do with the Hanged Man's serenity under duress is anyone's guess. For the minor arcana cards, notes are limited to a single keyword. It's a pity these keywords weren't written on the cards themselves. Minor arcana cards bear the number in the suit & the name of the suit in five languages: English, French, German, Spanish & Italian. 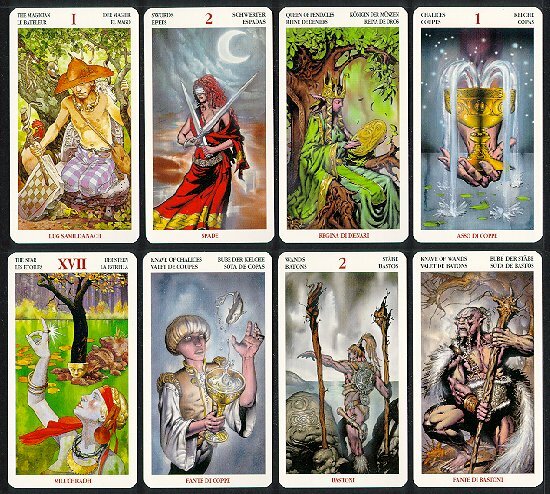 So an Irish-based Celtic tarot deck. Enjoy.